The Section element is used to structure page sections and create overlays with image and video backgrounds. The Section is a containing element that can be used to build page sections and structure your pages by section. Sections are super easy to use. Simply drag one onto your page to get started, you will find this within the right-hand side menu. 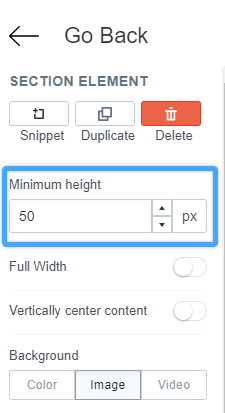 Setting the minimum height of your Section element can be a great way of showing off your background images, or just ensuring that your content has all the space that it needs. This can be set in the right-hand side menu of the editor. 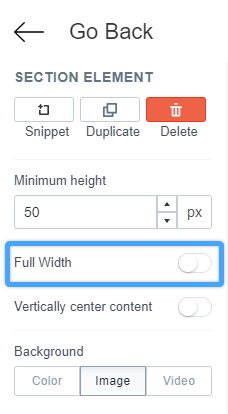 If your page is not full width, you can set the Section to Full Width. This will make use of all available horizontal space of the page. The Section element allows you to set an image, color or a video background. This is super helpful for creating backgrounds to your content. Cover ensures that your image fills the whole section. If you are having issues with your image being cut off, this may be why. Contain will ensure that your image appears full size, no matter what screen setting it is set to. 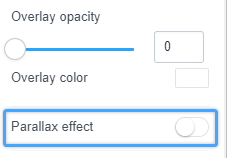 Enabling a parallax effect on your backgrounds is super easy! You can enable this in the right-hand menu of the Section element. A Section is a containing element - this means that you can add any element into a Section. Simply drag the element that you would like into the dropzone of the Section element and continue to build. 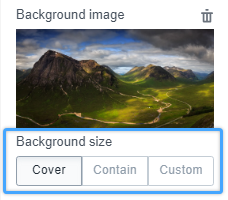 This is great for adding backgrounds to your content. The Section Element gives you numerous options to align your content vertically: top; bottom; and middle. Making a section of your page clickable is super easy with the Section Element. Simply toggle this on in the settings of the Section Element and insert the link that you would like to direct your user to.